Yes! I'm so excited to FINALLY have gotten my hands on this gorgeous bridal collection! 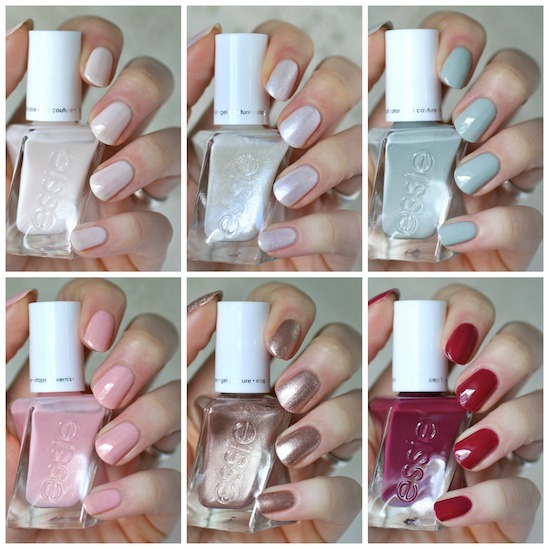 I was more than happy to discover Essie chose to release this year's bridal collection as 6 brand new Gel Coutures. 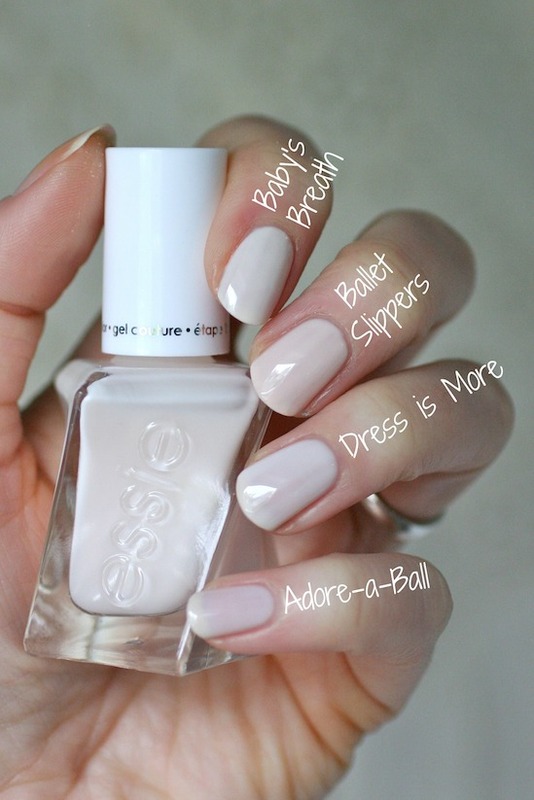 Gel Couture is my favourite Essie formula and brush and it lasts a nice long time on the nail, so that's perfect for your wedding day. I also love that Essie played up the idea of Couture and collaborated with Monique Lhuillier, a couture wedding dress designer. It gives this whole collection a sophisticated, luxury feel. 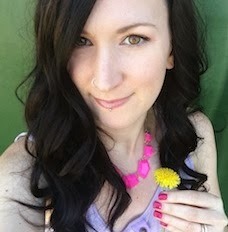 I think Monique did an absolutely fabulous job with the colours she created and I can't wait to show you swatches! This one is so pretty! This is the most classic polish shade that I think of when I think of "wedding nails". It's a squishy soft sheer white. I did 3 coats and you can still see my nail line but it's not streaky (well, super close up on my macro lens it looks streaky, but in person you don't really see it). It looks exactly as it should: clean and elegant. Keep your coats thin or you'll apply polish and a minute or two later, polish will run down the sides of your nail and end up in the cuticle. 3 thin coats is perfect for these elegant nails. Baby's Breath has a brighter, more opaque white look to it and Ballet Slippers has more blush pink tones to it. Adore-a-Ball was the closest although it's a touch more sheer. Wow! This shade is STUNNING. The fine sparkles are so sparkly and they cover the nail so beautifully. It's pretty opaque in 2 coats and is nice and even with no streaking but you can still see your nail line a bit. I thought it looked beautiful but decided to go for one more coat. The effect is shimmery satin. It's so gorgeous. I knew there was no other Essie polish like Lace to the Altar but I did this comparison based on a request. It was a great request too because the fine sparkles in Lace to the Altar are super similar to Pure Pearlfection. There's just way more of them so they are more dense. There's also a satin white jelly base in Lace to the Altar while Pure Pearlfection is in a clear base. This is 3 coats of Pure Pearlfection and 2 coats of Lace to the Altar. This is a muted soft crelly pink polish. There are gold flakes throughout this polish adding a pretty flair to a typical sheer pink. Again this is 3 coats, but it was also good at 2. Of course I didn't have anything exactly like Blush-Worthy because of those gold flakes, but I wanted to show you how the pink base colour compared. 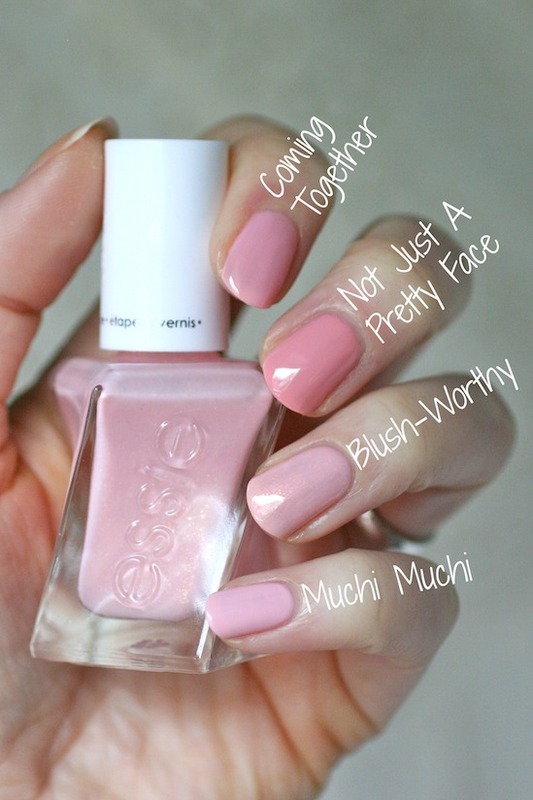 It's closest to Muchi Muchi but Blush-Worthy isn't quite as bright. It's got a softer, more toned down look to it. 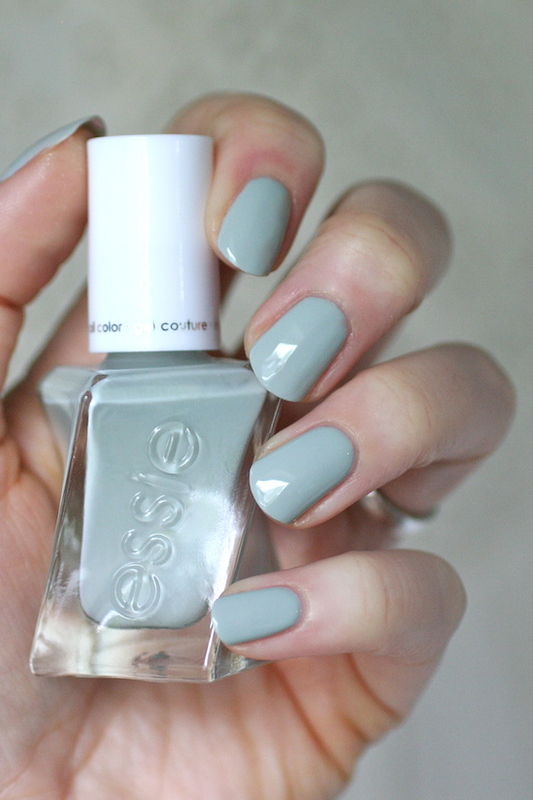 This shade is beautiful and not a typical wedding nail shade. It would be so beautiful in a Fall or Winter wedding. It's smooth and easy to apply. It was almost perfect at 2 coats but there was a little bit of my nail showing through so I went with three coats. 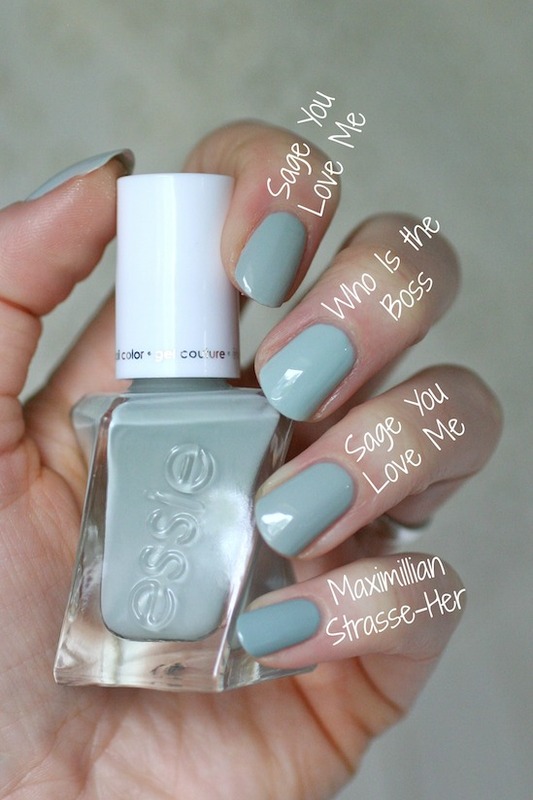 One of my favourite Essie polishes ever is Who is the Boss, a soft light grey green. 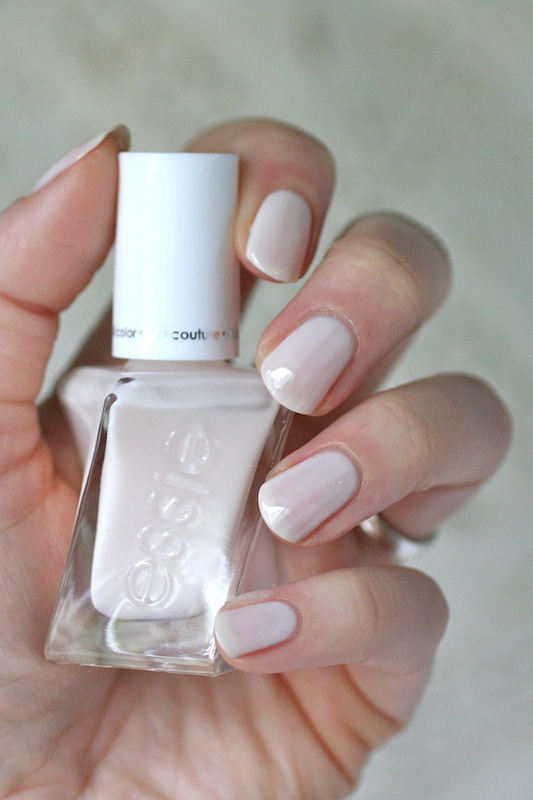 It too came out in an Essie Wedding Collection. It looks very similar to Sage You Love Me but it's a touch lighter a brighter. Maximillian Strasse-Her is a hair darker. 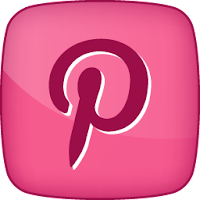 Wearing an antique rose gold nail on your wedding day? That's such a perfect idea! 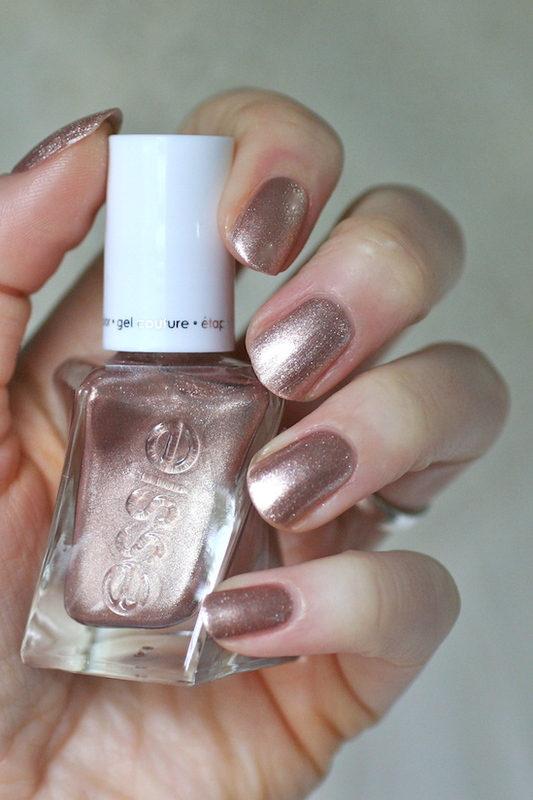 This polish is so smooth and beautiful but with fine shimmery sparkles. It's totally gorgeous. It was really close to opaque on 2 coats but I could still see my nail line so I went with 3. I grabbed Getting Groovy just to see if it was a similar finish and it is. Both To Have and To Gold and Getting Groovy are made up of very fine shimmering sparkles that catch the light in such a beautiful way. 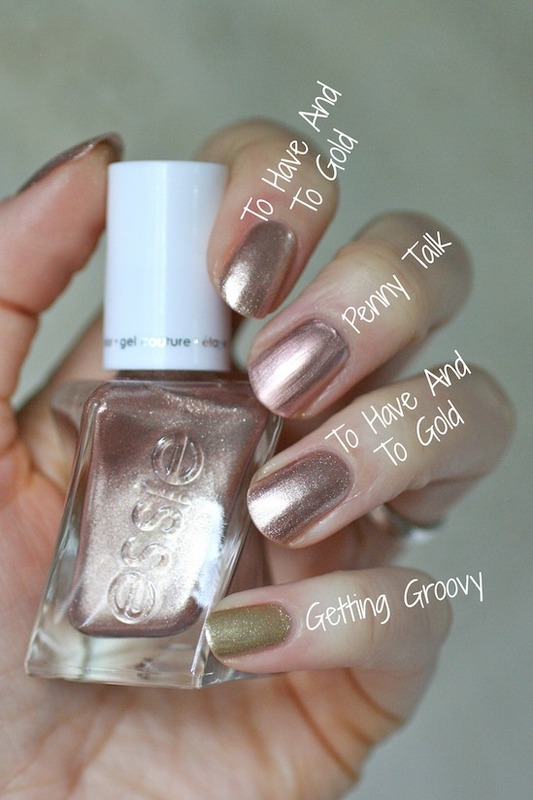 Penny Talk is a similar rose gold colour but To Have And To Gold has less of that rosy pink tone. You can also see that the fine sparkle finish of To Have And to Gold doesn't highlight nail ridges or brush strokes like Penny Talk does. This isn't a typical shade I would think of for a bride's wedding day but it's a very classic shade and would be perfect in a Fall or Winter wedding. Berry in Love is easy to apply. This is two coats. There's some very light unevenness at 2 coats but I decided to leave it. I wish I hadn't and had just gone for the 3rd coat because the close-up macro lens picked up on the unevenness much more than it looked in person. That's something to keep in mind for your wedding day. I would go with 3 coats for every single one of these polishes since you'll probably have close-up pictures taken of your hands with your wedding rings. I had nothing quite like it, although as soon as I applied Berry in Love it made me think of Big Spender. I do wonder how close they would be. Bahama Mama and Gala-Vanting were too dark and Gala-Vanting also leaned more to the deep red side. 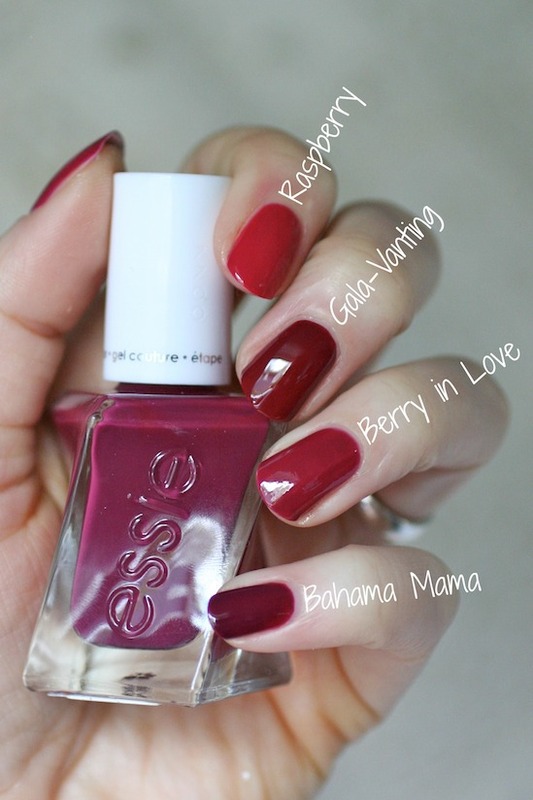 Berry in Love is definitely a "berry" tone. Raspberry was too light and pink in comparison. There are so many great polishes in this collection, perfect for any brides taste in any season. I honestly love ALL of these polishes and will wear all of them for sure a million times this year, but if it were me getting married, I'd choose Dress is More or Lace to the Altar. I love how clean, elegant and classic Dress is More looks. But Lace to the Altar is absolutely stunning with that shimmer so it would be hard for me to choose between the two! Essie has been stressing on Instagram that these shades are Limited Edition, so if there are any polishes you've been eyeing up, I wouldn't hesitate to scoop them up! Are there any polishes from this collection you've been thinking of getting? Which one would you wear on your wedding day? I love the gel couture line and hope they bring some more out soon. I got to have and to gold from this collection. I loooved these colors! 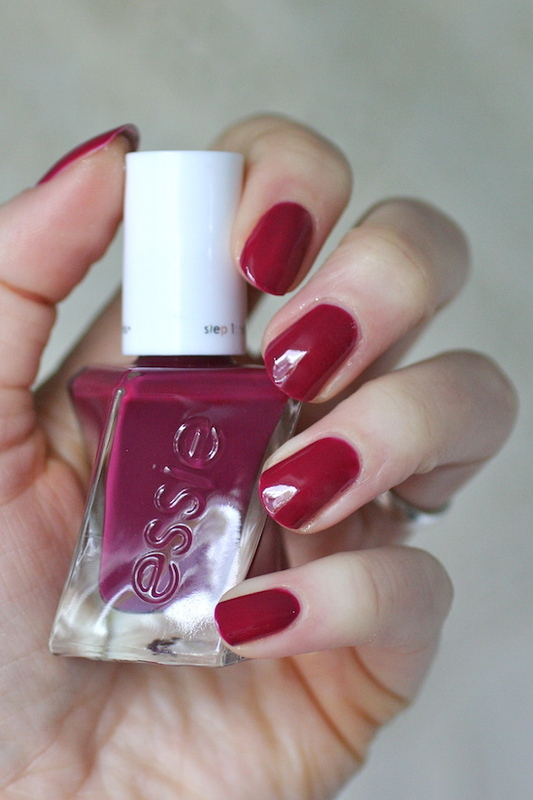 I have worn Berry in Love, Sage You Love Me, and used Lace to the Altar as a top coat on an accent nail. I did 3 coats with Berry in Love and wish I had gone with 2...maybe it's just the way I did the coats, but I felt like making it more opaque made it shine a bit less. But maybe that's just me! I went with 2 coats with Sage You Love Me, personally. I loved wearing this color! 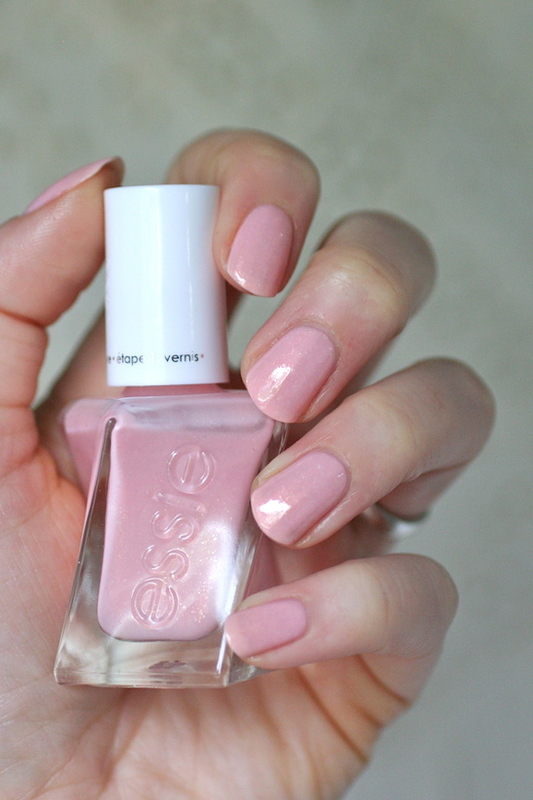 Yes Essie did a fantastic job on this collection! I love all of them. That's an interesting note you brought up about Berry in Love. I didn't want to deepen the color so I left it at 2 coats but then regretted it. I'll see what I think at 3 coats. Great pick from this collection Shimmering Highlights! 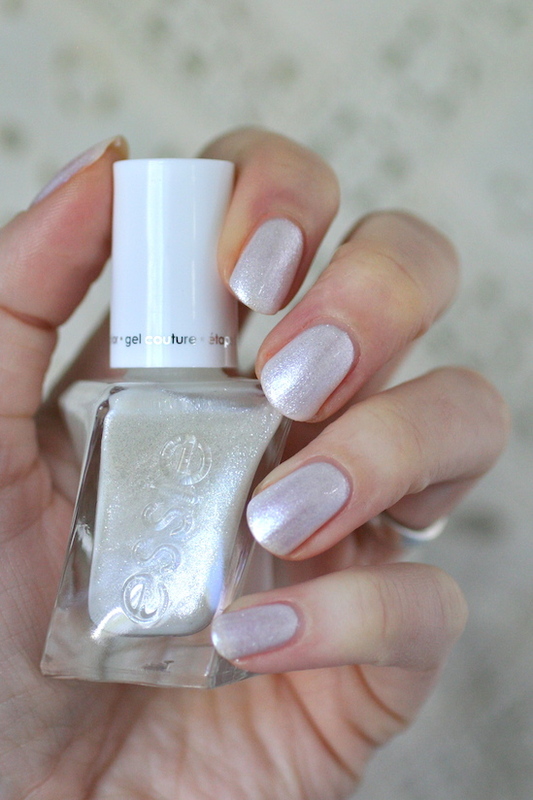 I saw a sneak peek and Essie is bringing out some new gel couture this summer. Can't wait! !